To all who had problems with crooked Fingers with the Rigify-Meta-Rig-for-MB-Lab add-on: I (finally) found the problem and I’ll write a fix in the next days. Edit: Add-on has been updated. The crooked fingers should be fixed. Let’s cross fingers. A big Thank you to all the folks working on this. I am truly sorry Manuel had to abandon this really awesome tool. I haven’t used the 2.8 version but it looks amazing. The 2.8 UI just doesn’t feel comfortable after so many years with the old controls but eventually I’ll convert. Regardless, I see all the hard work that is going into the development so again…thanks. Any idea why MB lab doesn’t recognize characters for proxy?. Only way it does is by creating a new one but it wouldn’t detect an imported one. You did absolut the right steps . The results are great up to amazing. and you raised the out of the box visual quality because its your primary passion. It will take some time to understand the core and to find ways to extend it because of very special knowledge from Manuel. But i am sure it will be an success. Step by step. I would simply ask Ton if he has some tips. Think he has neverending experience. And, why not open a Patron or other monetarisation and see what happens. When you feel unconfortable it is ok. I do apologize for the lack of updates and replies, it has been a busy couple of weeks for me in the real world. I am considering a Patreon account for support of a website, as web hosts are not cheap, for a couple of reasons. One reason is that Github packages up MB-Lab as ‘MB-Lab-1.7.3’ for example and Blender does not like periods in the package. This is one of the most common issues MB-Lab has, the first step to installing. I am keeping it on Github for dev purposes of course but to release it as a package on a website would help. The current website has a really long URL that is not memorable, so that too. MB-Lab 1.7.4 is almost ready for release, the shaders have been changed and working on the texture maps now. 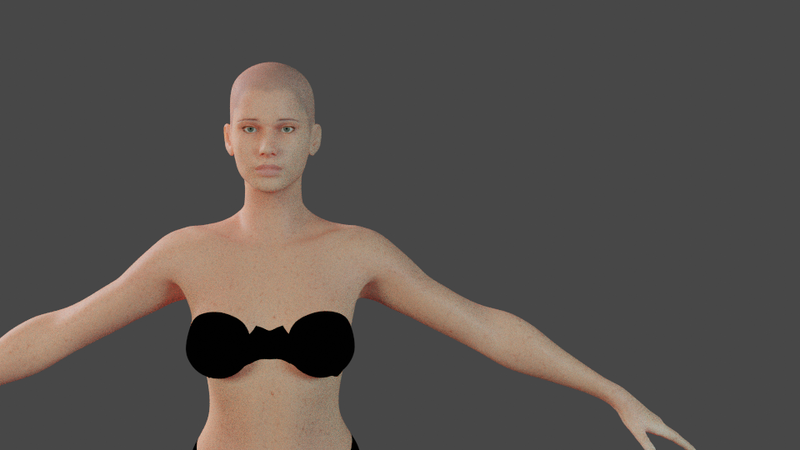 Had to do some re-assigning of shaders to the eyes to make them fully procedural. Also fixed a startup bug that kept adding lights to files when they were deleted, the lighting setup by default is set to False now. Thinking of changing the lighting setup itself too, using area lights and updating the code as well. There was the idea of throwing an HDRI file in the project BUT that would just add more to the size of the project than be useful. 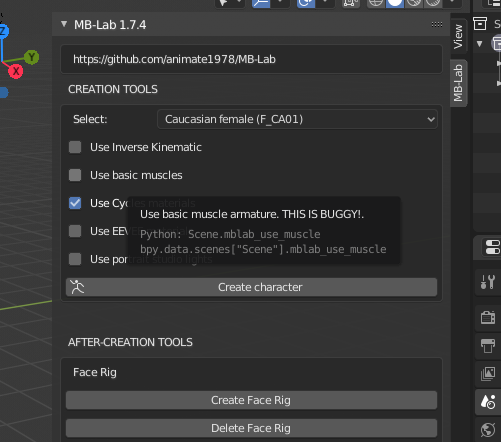 MB-Lab 1.7.4 has been released. This was a “silent” test release, I wanted to see some data go through Github before I made some announcement on Blenderartists. Github doesn’t offer a whole lot of data related to traffic but it’s enough to gauge response on the internet. So far traffic has not increased as much as I would have expected but that’s ok. For being an experiment it did not go bad, update testing on the “Live” version went well on both my end as well other devs. So that’s cool! This is a primarily a shader and texture map update, as explained above in some of my posts I was unhappy with the Principled BSDF shader network I had made. Maybe some more work could have been done but in the end it was decided to go back to a custom skin shader once again. I reused some of Manuel’s original skin reflection network again, making it work for this new shader. 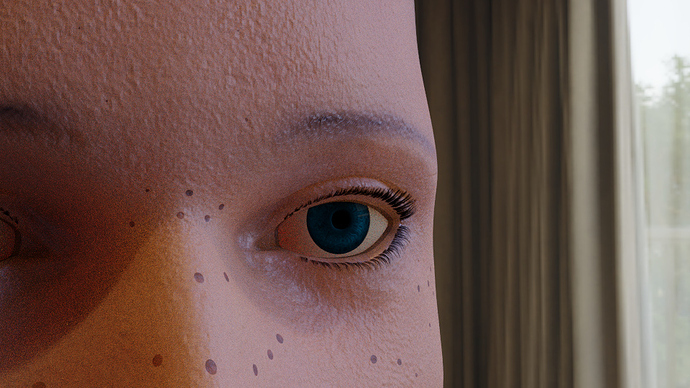 The eyes have been re-worked to be fully procedural, so you can change the color of the iris to your liking rather than a color range of unrealistic iris colors. Currently in the master branch of MB-Lab the eyeball shader looks “weird”, which comapred to my devopment file of 1.7.4 makes no sense because the shader network is the same in both. The UV map has been unchanged and the eye maps are still in the repo, they don’t take up much space, so MB-Lab characters can still be exported for game engines if that is your purpose. The skin also has procedural veins, though they had to be re-worked from my original version because the Overlay effect would interfere with the Skin complexion settings. 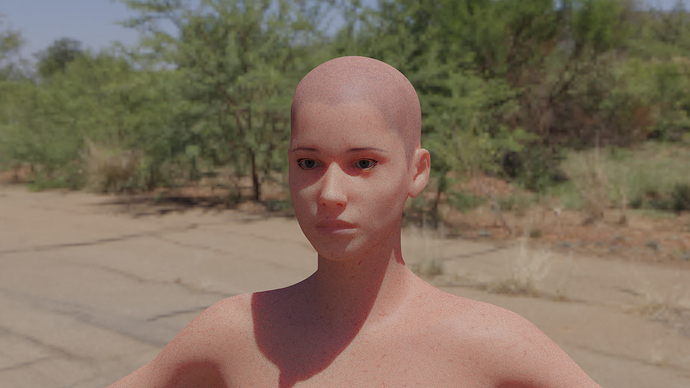 The skin “oil” has also been changed a bit, instead of it being there or not, it now gives the effect of being “slick” or “rough”, long story short I messed up the math in the shader so just worked it out this way because I simply couldn’t figure it out, besides humans naturally have oil on them all the time, this just makes it easier to make “super oily” skin. 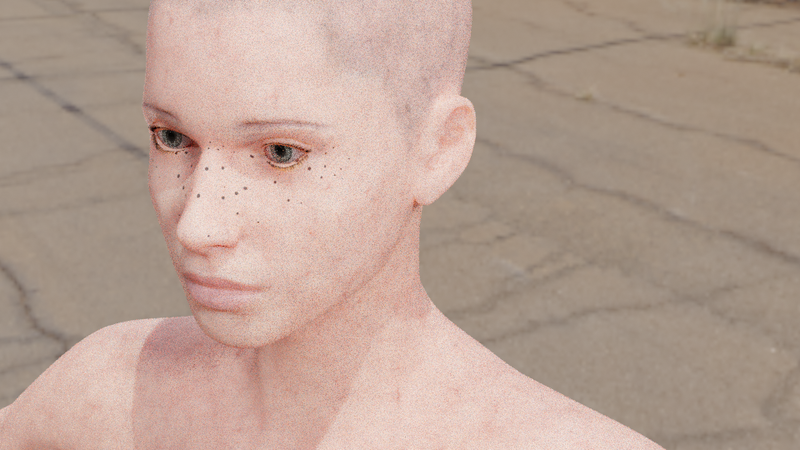 The freckles now rely on a texture mask for visablity, though you will notice small freckles on the skin everywhere, the mask just brings the function out more in “whiter” areas. You can edit this map to you liking in Texture Paint mode. The sub dermal map has been scaled down, there is little need for detail just for an effect that is “below” the surface of the skin. This also reduced the file size quite a bit. The GUI looks a little different now but nothing major but ideas are floating for future changes just not sure what or where just yet. The lighting setup at startup has been set to False, this fixes a minor bug that added lights to scenes when you opened them up after saving. This was an irritation I agree. The light arrangement has changed as well, using Area lights in a three point setup. Looks a little better I think. Word of warning is that if using EEVEE the lighting is a bit high, I am working on it for a fix. 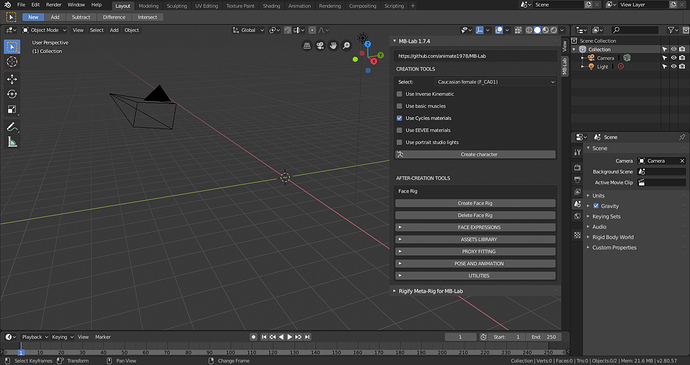 There is still the outstanding Auto-Updater unregistering bug, so you still can’t disable MB-Lab from inside Blender. If you choose to delete MB-Lab you need to just delete the addon from your file system manually. This is a buggy release as of right now, I am sorry I thought I worked out everything , but we are trying to get bugs fixed, this weekend I am working on this eye shader issue. Looking good… thanks for the updates.